Gen. Stanley A. McChrystal is in charge no more. After two days of intense talks about his departure, he tendered his resignation as the man in charge of NATO troops in Afghanistan. President Barack Obama –-- angered by remarks about the White House and the US ambassador in Kabul made by the general and his aides to Rolling Stone magazine--- graciously accepted the resignation. He immediately Gen. David Petraeus, the architect of the US troop surge policy in Iraq in 2008 that likely salvaged the war there, in his stead. Has a crisis been averted? Probably not. Even though President Obama saved face and probably made small gains with the hawkish portion of the US electorate --- just in time for the November mid-term elections, I might add --– the decision will have dire consequences for Obama’s war plan in Afghanistan. The reason is quite simple; nothing was actually done in the past days to understand the reasons why Gen. McChrystal made his remarks or to address the issues. The situation with McChrystal and the White House is a by-product of two distinct but interrelated issues. 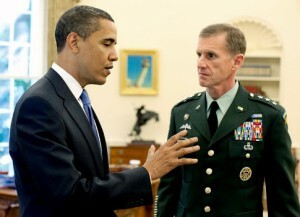 The first is Gen. McChrystal’s relationship with President Obama, the Commander-in-Chief. The second is his relationship with the US Ambassador to Afghanistan, Ret. Lt. Gen. Karl Eikenberry, who was largely ignored in this fiasco by US media. The first action that led to Wednesday's decision was the State Department's despatch of Eikenberry to Kabul in April of last year, two months before McChrystal’s appointment. Before his appointment, Eikenberry had served two terms in Afghanistan, commanding US and international troops. His last posting was as the Commander of the Combined Forces Command for 18 months before he stepped down in 2007. McChrystal’s complaints about Eikenberry had some merit. During his tours in Afghanistan, Eikenberry’s role in the war was not appreciated, but in that time the Taliban got stronger and the insurgency spread further. And as a former commander of the same troops McChrystal was leading, it does not look like Eikenberry helped the new US commander very much. The clash was inevitable: McChrystal had an agenda, and Eikenberry’s presence in Kabul meant the general had to deal with someone with his own ideas and plans about Afghanistan. McChrystal worked closely with the Afghan people. He took the war --- for the first time since the ouster of the Taliban –-- straight to the insurgency’s comfort zone. He carefully controlled the bombing of areas with high concentration of civilians. But most of all, he forged links with the Afghan government, which has had a sour relationship with President Obama since last year’s elections in Kabul. All of these strategies helped propel him in popularity within Afghanistan, as local actors looked set to help him accomplish his goals. It was not to be. There’s an old saying in Urdu, “You cannot hang two swords in one scabbard.” Friction arose because Eikenberry was not as popular as McChrystal. Eikenberry was also a strong critic of Afghan President Hamid Karzai, with whom McChrystal was attempting to forge close ties to help fight the insurgency. The second catalyst that brought McChrystal’s ouster was the President himself. Obama took an awful lot of time in deciding what to do in Afghanistan when he took office; the entire year of 2009 was wasted on crafting his war policy. By the time it was made public, winter had arrived and offensives against insurgents were impossible in snow-covered Afghan mountains. Perhaps Obama wanted to study his options carefully. Maybe he had to focus on other issues. Whatever the reason, for a man of action like Gen. McChrystal, political considerations were not the main issue. He needed more troops to follow the US war plan. He only started getting them this spring. No general –-- especially not McChrystal, who’s known to resent civilian meddling in military matters –-- could escape frustration when faced with such a situation. When McChrystal finally got troops, he had to figure out a way around Eikenberry’s meddling into what was supposed to be his operation. McChrystal may have been the most popular US general that has been put in charge of troops in Afghanistan. He may have led the offensive deep into Taliban heartland, forged close ties with the Afghan government and the people, and reduced civilian casualties dramatically. But he proved himself to be incompetent when it came to giving interviews to the media. As word of McChrystal's imminent departure emerged and gathered strength, Afghan policians reacted by heaping praise upon him and pleading how important it was for the commander to stay in the country. Gen. McChrystal might have been forgiven for his Rolling Stone mistake had he not committed it just months before the November --- Defense Secretary Robert Gates seemed to have been open to the possibility of keeping him. President Obama’s political advisers, however, sided with a decision that would improve Obama’s image as a strong Commander-in-Chief and win him more votes. has welcomed his appointment. But the task of forming close ties with the Afghan government people to win a war –-- all in a year before US troops start departing Afghanistan in July 2011 --- looks impossible. Would Obama look good if he kept someone who disrespected him so publically? Probably not. The President had to make a choice between a successful implementation of his war plan in Afghanistan and votes for the Democrats in November. He chose the latter. Gen. McChrystal is not done. He’s around. He’ll be giving out more interviews and throwing some more mud on Obama and his political advisers, as well as Ambassador Eikenberry. So if Obama thinks he’s dodged the bullet by making a tough decision, he’s very wrong. The show’s only began, folks. 855 You'll need nine dark strips and eight white strips for that weave. The only real continuous that continues to be in our children's lives, year in, year out, louis vuitton qvc would seem for being their very nearly phobic distaste for going for walks. Josh, what is up with this giant love note to McChrystal? "When McChrystal finally got troops, he had to figure out a way around Eikenberry’s meddling into what was supposed to be his operation. McChrystal may have been the most popular US general that has been put in charge of troops in Afghanistan. He may have led the offensive deep into Taliban heartland, forged close ties with the Afghan government and the people, and reduced civilian casualties dramatically. But he proved himself to be incompetent when it came to giving interviews to the media." Eikenberry's meddling? I thought he was another "sword in the scabbard" of counterinsurgency? Why is it "meddling" when Eikenberry participates? Forged close ties with the Afghan government and the people? You mean Karzai, right? Suddenly he speaks for "the people?" Reduced civilian casualties dramatically? Come on, dude. McChrystal and his subordinates aired their "beefs" out publicly. That's the reason he's gone. It's not really that complicated. If he'd kept the complaints within the chain of command -- as he's required too under the military code -- odds are he would still be in his job. The comments about allies and about civilians undercuts his credibility and that of the U.S. with those allies and other civilian leaders. They create additional difficulty in an already complicated military campaign. The comments under-cut the goals of counter-insurgency doctrine itself -- which require buy-in from all stake-holders -- military and non-military. This is not the first time that a general has been removed in part for public comments. MacArthur is obviously the most notable example -- although his case is even more extreme and the political costs of his removal were even higher for Truman. During the period when he was Supreme Commander of Allied Forces in WWII there are stories of Eisenhower having removed junior officers and a one-star general and classmate for having made disparaging remarks about the ability of the British to fight while at a bar (e.g. Eisenhower placed a higher value on the alliance than he did on keeping the particular general -- a classmate at West Point -- in his position). That is probably a closer analogy here. In this case, McChrystal is largely a blank slate in the eyes of the American public -- he had some strong pluses (killing Zarqawi, a track record as a smart, aggressive general) and some strong minuses (involvement in the Pat Tillman murder cover-up; and involvement in prisoner abuse in Iraq). The Afghan War too is a secondary consideration in light of more pressing domestic concerns in the U.S. (e.g. namely the current state of the economy and unusually high levels of unemployment in the domestic economy; a shaky domestic recovery from the 2007-2009 recession). So this idea that McChrystal was removed because of November political considerations strikes me as a stretch. The removal will create no new votes for Democrats in 2010 -- it might cost them a handful. Given that the war in Afghanistan is unpopular with the U.S. public right now -- the very fact that Obama is continuing with the current commitment and standing by his 2009 increase in troop levels poses an even greater risk to his domestic popularity. If Obama and his team were purely motivated by domestic politics, odds are there would have been no increased troop commitment in 2009. "Kabul circles say the dismissal of US commander was over leaking information including NATO's connection with the executed leader of the Jundallah terrorist group, Abdolmalek Rigi. Head of Press TV's office in Kabul, Mohammad Ruhi, says US commander General Stanley McChrystal was sacked for acknowledging NATO's connection with the executed leader of the Pakistan-based Jundallah terrorist group, Abdolmalek Rigi. He dismissed the official reasons for the firing of McChrystal, saying his growing friendship with Afghan President Hamid Karzai and intelligence leaks may have triggered the replacement. The move caused a scandal, and a British minister was sacked. In retaliation, London is believed to have released confidential statements by McChrystal to White House officials, paving the way for the commander's removal from his post. Ruhi says many insiders also link the decision to the escalating number of US casualties in the war-torn country since the beginning of 2010. "The general opinion is that Petraeus' reputation as the 'butcher of Iraq' is meant to intimidate militants as well as Afghans," he added. Furthermore, Karzai's increasingly vocal protests over the civilian death toll of US and NATO operations and McChrystal's acknowledgement of mistakes fueled tensions with the US Ambassador to Kabul, Karl Eikenberry. The friendship between the two also entailed other top intelligence leaks, with McChrystal briefing Karzai on plans to mobilize Taliban militants from the volatile south to the north, Britain's arms and drug smuggling route from Afghanistan to Central Asia as well as links with the Russian mafia. That's hilarious! Of course for a "news" outlet that operates like PressTV, the notion of a simple explanation is too bland. There MUST be an elaborate conspiracy to explain it all. It's a shame, in another 20 years, once Iran adopts a more open concept of freedom of the press a lot of current working "journalists" in the state-controlled media are going to have to find a new line of work. The silver lining is that writing comedy and third-rate fiction can still be a lucrative calling (albeit a highly competitive one). Well, one man's giant love note is another man's reasons as to why. Yes, Eikenberry IS meddling. The point of the proverb is that you cannot put two people in charge of the same job. There needs to be a civilian as ambassador - not a former general who has his own ideas about how to fight this war. NWFP is not the Taliban's homeland. I'm sure you meant FATA. If you meant FATA, then let's discuss this. As for the Government and people, I have put them there distinctly. Yes, he did forge close ties with Karzai. In the absence of anyone else in power, forging closer ties with Karzai will help in the long-run. Yes, he won the election by cheating, but you don't have anyone else in Bala Hisar, do you now? "Defense Secretary Robert Gates seemed to have been open to the possibility of keeping him." That's not the same as "Gates wanted to keep him." It's in the same family, but not the same. "Mr. Obama, aides say, consulted with advisers - some, like Defense Secretary Robert M. Gates, who warned of the dangers of replacing General McChrystal,"
I'd say that supports what I have said here quite clearly. 2. Yes, "relatively fewer" civilian casualties. It's sort of like after the crackdowns, Iranians had "relatively fewer" rights, huh? Hey, sorry about your kids, Afghan, you've just got "relatively fewer" family members now! You should be thanking us. 3. Wash on Gates. I don't have any reason to believe those anonymous sources, but then again there's not much reason not to either. FATA = Federally Administered Tribal Areas... South Waziristan and all that jazz, that's where they're at. 2. No. Dramatic is accurate because until 2009, casualties were rising and then suddenly, you have a huge drop. 3. Well, I'll take my chances with NYT and CNN. Did you notice it was a PressTV correspondant interviewing another PressTV correspondant for this find!!! Oh I must say this is objective, non biased, and reality based journalism at its finest! Of course when I did a search of this subject PressTV was of course the only one with the story!! If anything this article was worth a good laugh! "Head of Press TV's office in Kabul, Mohammad Ruhi, says US commander General Stanley McChrystal was sacked for acknowledging NATO's connection with the executed leader of the Pakistan-based Jundallah terrorist group, Abdolmalek Rigi." LOL!!! WitteKr - that's priceless! Thanks for posting.